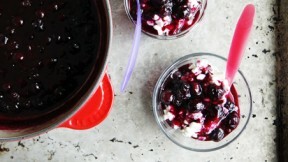 This recipe for blueberry sauce from Alice Currah of Savory Sweet Life is quick and easy. It can be made in under 10 minutes and can be used for pancake syrup as a dessert topping. See the full post Kitchen Explorers. In a small bowl, mix the water and corn starch together until the starch is completely dissolved without lumps. Pour the water into a non-stick or coated cast-iron pan. Add blueberries, brown sugar, and lemon juice. Heat the mixture on medium high heat for 5-7 minutes. The blueberry sauce should be as thick as maple syrup but not as thick as jam. Remove the sauce from heat and serve immediately or allow it to cool before storing in a sealed container.